Read my post on lugnet.robotics describing what I'm up to. The project on a breadboard shortly after I first got it going. On the left you see a 2x8 electrical plate which has been modified to be 4 individual 2x2 pads connected by the gray ribbon cable to a header on the breadboard. 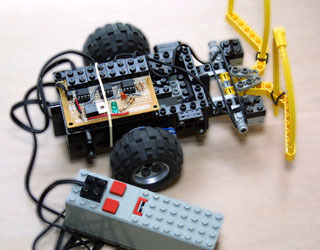 The yellow wires connect it to the motor drivers, and the green wires connect the sensor pads. On the far right is the 5v regulator and an on/off switch (since I had hotwired the battery box). Don't actually wire it up that way -- long ground paths and electrical noise from the motors (probably reverse current when they are stopped) lead to electrical gremlins with anything larger than a micromotor. Here I've soldered a more recent version of the prototype to a Radio Shack PCB and you see it riding around on the back of a chassis that has been on my LEGO table for years. The 7805 5v regulator and LED draw most of the idle current. Good thing they're not going in the surface mount version! 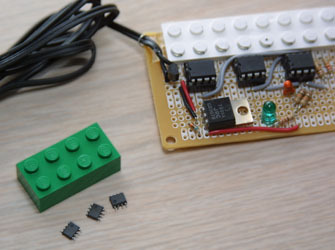 Now compare the protoboard with a 2x4 LEGO brick and three 8-pin SOIC chips representing the DIP parts on the protoboard (those aren't actually the right chips, just stuff I got in a grab bag -- I don't know WHAT they are). Gives you an idea how the design will fit in the 2x4 brick. Anyone who would build this from parts can probably guess the parts faster than I can type them in, but just in case: The motor drivers are Microchip TC4427A Dual High-Speed MOSFET drivers (obviously minus the FETs, just driving the motors directly) and the microcontroller is a Microchip 12F675. On the prototype 5v is provided by a 7805, which is a horrible choice, but convenient. The final version will use a LP2980 in SOT23. 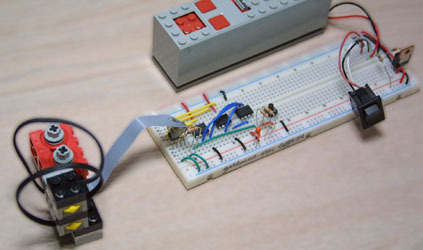 A 2N7000 is providing reverse-voltage protection (though the breadboard is pictured with a diode instead). I've picked out an NDS351AN in SOT23 for the tiny version -- much lower RDS but I don't have anything comparable for the prototype.